In the April issue I (Jessie) wrote an article with some recipes for using up the produce that is popping up this time of year: asparagus, beets, broccoli, carrots, kale, radishes, turnips, and spinach. I shared recipes for our favorite Tropical Green Smoothie, some biscuits enhanced with beets, roasted radishes, and my mother-in-law’s infamous broccoli salad. Here are 10 more recipes to try this Spring! Asparagus and Goat Cheese Frittata at Jessie Weaver – This is one I created for the magazine, but I decided it’s probably best for adventurous eaters! Do your kids eat vegetables? 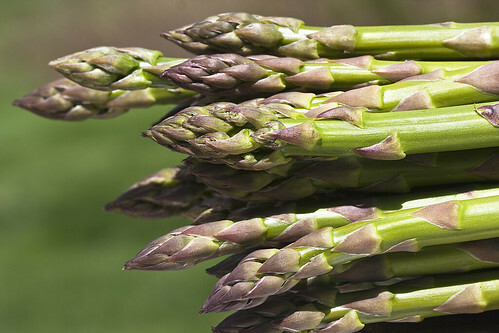 What’s your favorite of these spring veggies? Forget Cookie Baking & Embrace Cooking Dipping for Christmas Gifts! Personally, I love baking cookies. But I’m also a stay-at-home mom, so I have more time at home than many. And this year, I still haven’t been in the kitchen much as I’ve dealt with sickness, school events, and just general life stuff. If you, too, have been lacking for time to make homemade treats, I wanted to share with you my easiest tips and recipes for making a giant batch of semi-homemade goodies to hand out. When I was working, I would fill a Christmas tin from the thrift store for all my co-workers with these yummies. It takes just an hour or two to make all the treats, as opposed to hours baking dozens of cookies. And everyone loves them! Open all packages of dippers so you are ready. Place different sprinkling items on plates. Lay out wax or parchment paper for items to dry on. Melt chocolates in the microwave in large measuring cups. For melting chocolate, I always microwave on high for 1 minute, stir, then microwave in additional 15-30 second intervals, stirring after each, until completely smooth. Be careful with white chocolate or almond bark, because it is more likely to scorch. 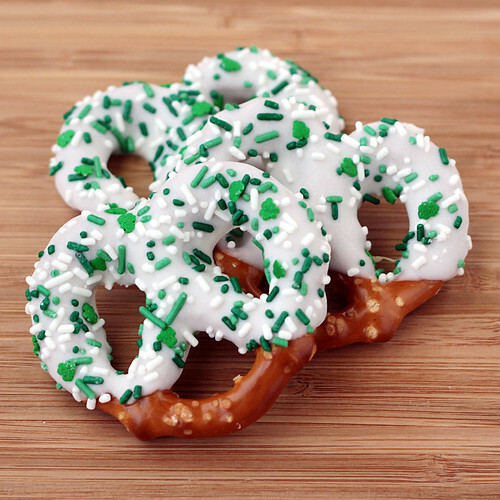 Dip each cookie or pretzel about halfway into the chocolate. Then press into a sprinkling item. Place on wax paper to dry. With this method, you can make a large variety of treats simply by using different sprinkling toppings. So fun, and easy for the kids to help with, too, for teacher, bus driver, mail person, Sunday School teacher, pastor (you get this idea!) gifts! Melt white almond bark in the microwave. Spread onto a jelly-roll pan lined with parchment paper. Sprinkle with crushed candy canes. Let cool, then break into pieces. It looks fancy but couldn’t be easier. Do you pass out cookies or other treats during the holidays? Need a new pumpkin recipe for the season, to make with your kids or for a fall festival? Here are some of my personal favorites and a few I haven’t tried … yet. Pumkin Coffee Cake for Pumpkin Haters at Dude Mom – I like pumpkin, but this is seriously some of the best coffee cake ever. Pumpkin Pie Milkshake at Stuff Parents Need – No ice cream! Just frozen bananas and milk. Cinnamon & Chocolate Chip Pumpkin Cookies at Giving Up on Perfect – Possibly my favorite cookies in the world. Two years ago, we posted 25 Make-Ahead Breakfasts for Back to School, a post that’s been very popular. And why not? We all need breakfasts we can easily make in advance. Who wants to get up at 4 a.m. to start cooking? All of these recipes can either be made the night before or pre-made and frozen. Enjoy, and let us know if you try a recipe and love it! These spiders are made by spreading peanut butter between two Ritz crackers, sticking straight pretzels in for legs, and adding a few raisin eyes. They take about 45 seconds to put together. And my little ones think they are the best thing ever. Is it because they truly adore crackers, peanut butter, pretzels, and raisins? Not really. Those are all foods they like. But the excitement comes from the whimsy. From the silly act of eating an arachnid. And if it’s not your thing, I get that. But I love the light in my kids’ eyes when they have a “spider,” a pumpkin sandwich with candy eyes, a sandwich cut into a butterfly shape. It’s such a simple act that truly brings them enjoyment. It makes me think of how Jesus said we should come to Him like a child. My little ones grow wide-eyed and giggly every time they hear a jingle bell, open a Christmas book during December, or see a wreath on a door. They just take joy in the little things. They are in awe of Jesus and the world around them. I’m taking advantage of their childish joy while I can … and trying to grasp a little of my own through them. Tomorrow we’re all having snowman pancakes for breakfast. Personally, I think muffins are one the best “kid foods” there are. My kids will eat almost anything if it’s baked into a little handheld snack. Want them to eat squash? Carrots? Quinoa? Bake it into a muffin! Muffins can be breakfast, part of a lunchbox, a snack, or alongside soup with dinner. They can be sweet or savory, fluffy or dense, topped or not. Here are eight of my personal favorite muffin recipes. What are yours? September is National Honey Month! Why does honey get a whole month and not a day? Who knows!? But since 1989, beekeepers and their bees have been celebrated during September, a month when honey collecting winds to a close for the year in many parts of the U.S.
I’m always looking for a reason to celebrate, aren’t you? Why not do some exploring with your kids and find out more about honey and its uses? Taste-test different varieties of honey – raw, wildflower, clover, orange. Typically the darker the honey the more intense its flavor. 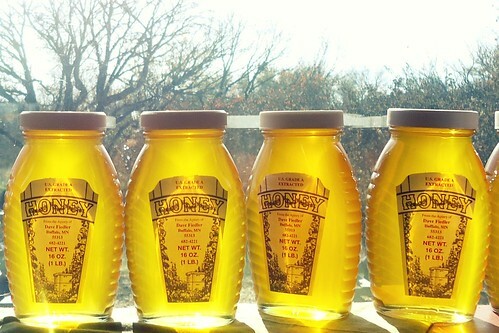 Seek out local honey if possible. Maybe you can even meet a beekeeper! See which honey you and your kids like best. Have a cough or sore throat? It’s widely hypothesized that a spoonful of honey is just as effective as cough syrup. You can make Honey Lemon Lollipops for the kids to help a sore throat, too. Honey can be used like Neosporin to treat cuts or burns! What your favorite thing to make or do with honey? I love hot tea with honey and lemon when I am sick – or even just hot water with those additions! One of the easiest ways to cut back on meal costs is to simplify your ingredients. If you can make a tasty recipe with fewer ingredients, you will probably spend less money. Often this involves slow-cooking, which intensifies flavor and tenderizes less costly cuts of meat. Here are some great recipe links to get you started. All the recipes have 5 ingredients or fewer, not counting salt and pepper. Add an easy side dish, like a frozen vegetable and rice, and you’ll be able to save (or give!) more money and spend less on food. *If you don’t use alcohol in your cooking, you should skip these recipes. And here are a few fun recipes from our friends on Facebook. Cabbage skillet: brown 1lb. hamburger with chopped onion, then add 2 cans drained Rotel and one small green cabbage sliced into ribbons. Add salt & pepper, cover, and cook until cabbage is tender. Serve over rice, with or without a slice of American cheese melted between. – from Nicole H.
Caramel Apple salad: Core and chop 4-5 Granny Smith apples, add 1 medium can of crushed pineapple with the juice & mix together. Sprinkle 1 box of butterscotch instant pudding (regular or sugar free), stir together. Stir in one 8 – 12 oz tub of cool whip. Chill before serving. (I don’t peel the apples but you can if you need to do so.). 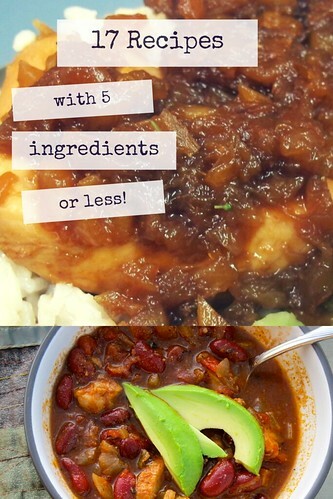 – from Becky M.
Have a favorite 5-ingredient-or-less recipe? Leave it for us in the comments! I’d love to have a few more in my arsenal for dinners.